These Gingersnap Cookies are my favorite Christmas cookie! 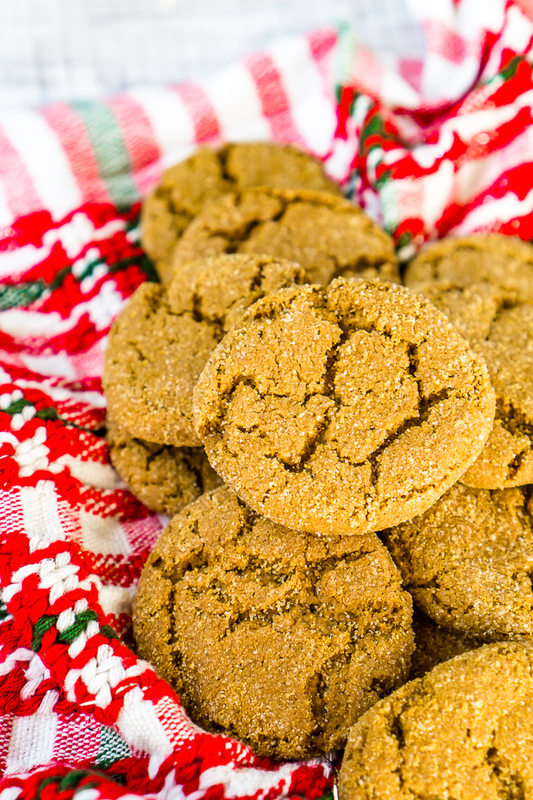 Soft, spiced cookies with rich molasses and a cracked, sugar top, these gingersnaps will be a hit all holiday season alongside hot cocoa, coffee, ice cream and more! 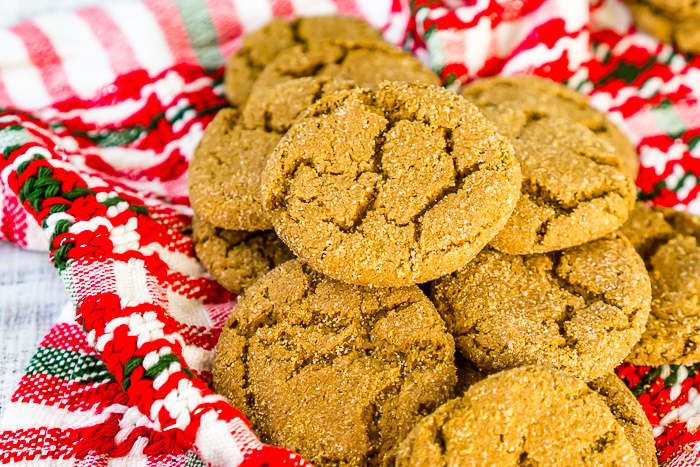 Gingersnap Cookies is a classic Christmas cookie recipe everyone will love! When I think of a Christmas cookies, I immediately think of two cookie recipes: classic sugar cookies without icing on top that produce a large batch of cookies that we made growing up every year and these gingersnap cookies that my sister always makes for me. These Gingersnaps are highly addictive! They are filled with a rich spiced flavor that comes from the brown sugar, molasses, ginger, and cinnamon and are coated with sugar on the outside! It doesn’t get much better than that! With one batch making over 40 cookies, this is also a great holiday cookie recipe to use for cookie exchanges or holiday gifting. I always appreciate being able to make one cookie dough like this during the holiday season instead of needing to make multiple batches of dough. Who has time for that?! WHAT IS MOLASSES AND WHICH KIND SHOULD I USE? Molasses is one of those baking ingredients that you can go all year without using until it’s time for winter baking because it pairs so well with traditionally winter spices like cinnamon, ginger, and nutmeg! When used, it provides a sweet, almost smokey flavor to the recipe. It is a sugar byproduct. When manufacturers make sugar, they boil the sugar cane and remove the crystalized sugar from the liquid. The remaining liquid is the molasses. The liquid residue from the first boiling is light or mild molasses; the second boiling produces dark or full molasses and the third boiling produces blackstrap molasses. Blackstrap molasses is never used in baking or cooking as far as I know. So which molasses should you use when? Light or original molasses is most commonly used. It is sweeter and milder in taste and is therefore the most popular choice for recipes like cookies, breads, and pancakes! It can also be used in marinades and sauces because it in thinner in consistency than the other types. Dark Molasses is thicker, stronger in flavor and less sweet. It can normally be used as a substitute for light molasses in baking recipes but it will provide a stronger punch to the recipe. It’s most common use is for gingerbread cookies, helping give them their distinct flavor and darker color. For this recipe of Gingersnap Cookies, I recommend using the light molasses as it keeps them nice and soft and provides a slightly more spiced flavor that everyone loves. However, if you like a bigger punch of flavor or only have dark molasses, you can definitely substitute and your cookies will still be tasty! CAN I SUBSTITUTE THE MOLASSES IN THESE GINGERSNAPS IF I DON’T HAVE ANY? There are two common molasses substitutions that I have heard of that you could try for this recipe. However, it is important to note that I have not tried either of these and cannot guarantee the end result of the cookies. These are just two substitution methods that are common in baking. Both substitutions will cause a slight difference in the end flavor. Substitute 1 cup of molasses for 1 cup dark corn syrup, honey or maple syrup. For the recipe below, it would be an equal substitution of 1/4 cup for a 1/4 cup. Substitute 1 cup of molasses for 3/4 cup firmly packed brown sugar. For the recipe below, it would be 3 tablespoons of firmly packed brown sugar instead of the 1/4 cup molasses. Before you measure out the molasses or any other sticky syrups for that matter, spray your measuring cup with your preferred cooking spray. This keeps the syrup from sticking to the cup, so it pours out easily and minimizes waste. 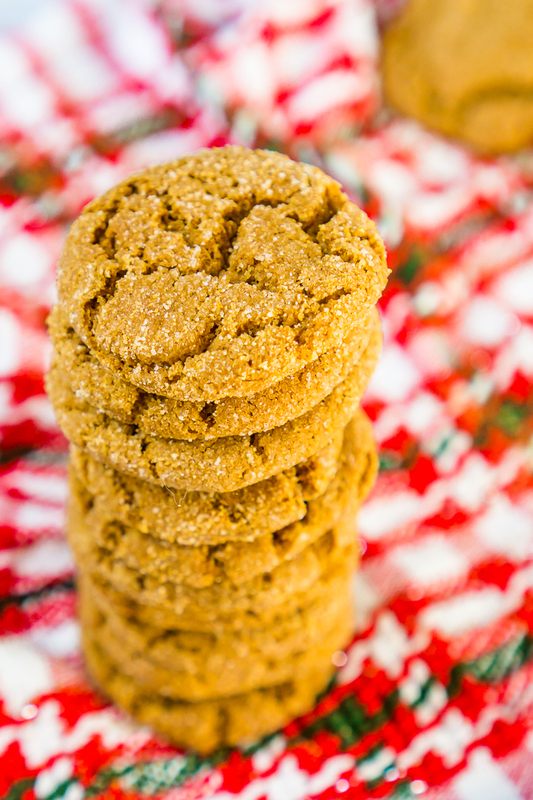 Whip up a classic Christmas cookie with these large batch Gingersnap Cookies! In medium bowl, mix flour, baking soda, salt, ginger and cinnamon. In large bowl, beat shortening and sugar with mixer until light and fluffy. Gradually stir in flour mixture until well mixed. Shape dough into 1 inch balls. Roll in additional sugar. Bake 12 minutes at 350 degrees F.